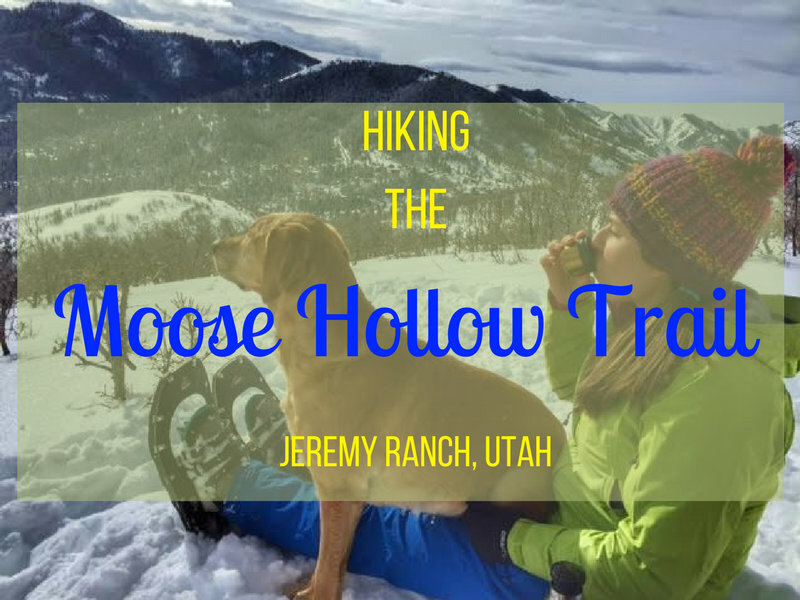 The Moose Hollow Trail near Jeremy Ranch/Kimball Junction is a lesser known hike that is perfect year-round - no worries about avalanche danger, great views of the area, dogs are allowed, it's never too steep, and it leads to a scenic overlook. 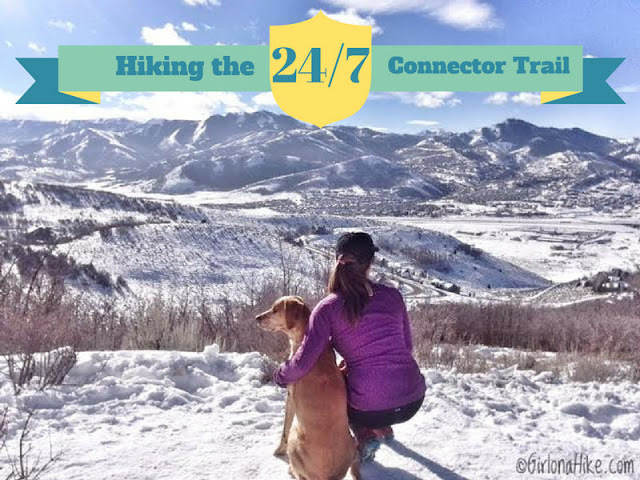 This trail is very popular in summer with mountain bikers, so the best time to hike with dogs is winter to avoid having them get trampled on and prevents hikers from having to move out of the way less often. Though this trail starts in the elite Jeremy Ranch neighborhood, this trail is open to the public and there are no fees. 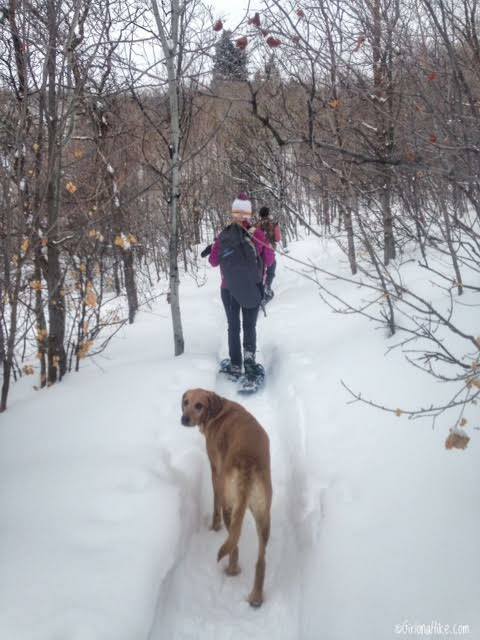 My friends and I hiked this right after a big snowstorm so it was perfect timing to use our snowshoes. 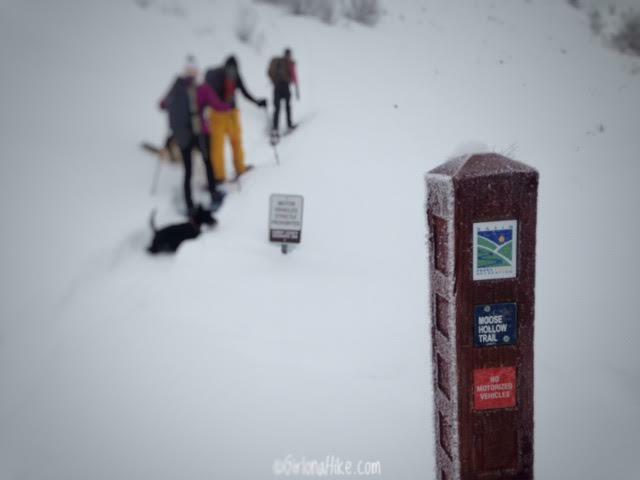 The trail was already broken, but if we didn't have snowshoes we would have been post-holing. Most of the time you could get by with just microspikes. If you came in Summer, this would be a great trail run as well. Technically dogs are supposed to be on-leash. From SLC, head East on I-80 through Parley's Canyon. Take exit 141 for Jeremy Ranch and turn left. Turn left at the first stop sign. At the round-a-bout, take the first right onto Jeremy Road. Drive 1 mile and park along the road. If you reach the winter gate, you've gone too far. The trail starts on the left (West) side of the road just past a house. Parking is right along the road. Here's a driving map. 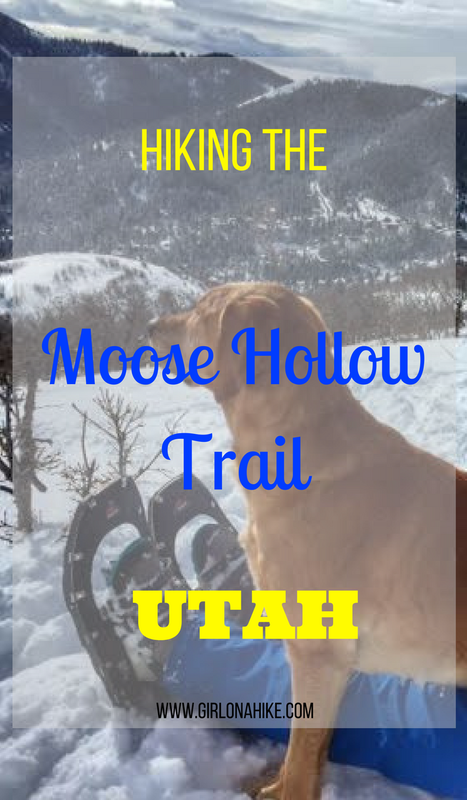 The Moose Hollow Trail is managed by Basin Recreation, and therefore the trail is really well managed and marked. They do an excellent job at keeping trails clean and available for the public. The trail immediately heads uphill and does one switchback. 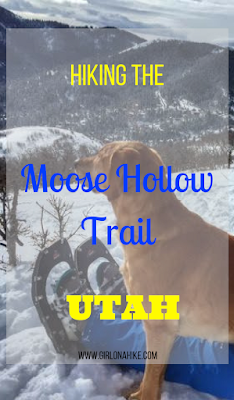 We all kept an eye out for moose on this trail, but we never actually saw any! You'll want to keep a leash handy in case you do come across wildlife. 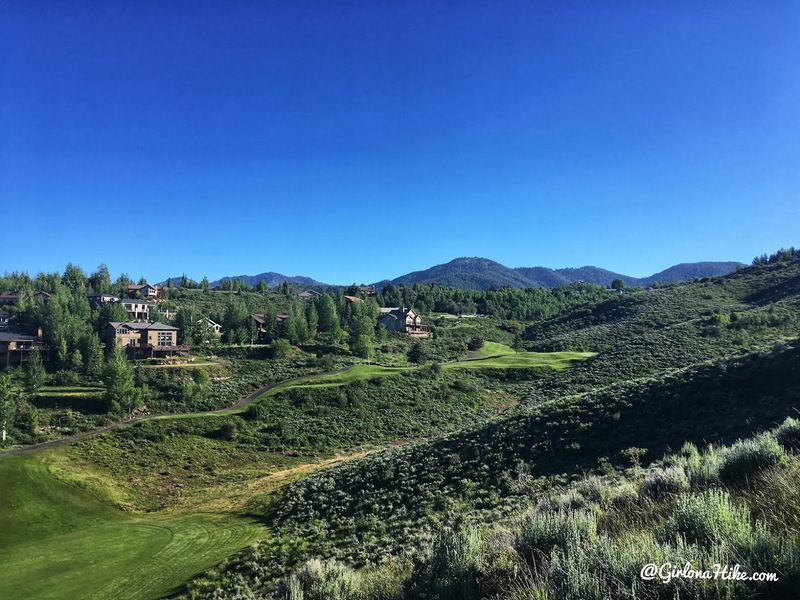 Hiking above Jeremy Ranch and the golf course. 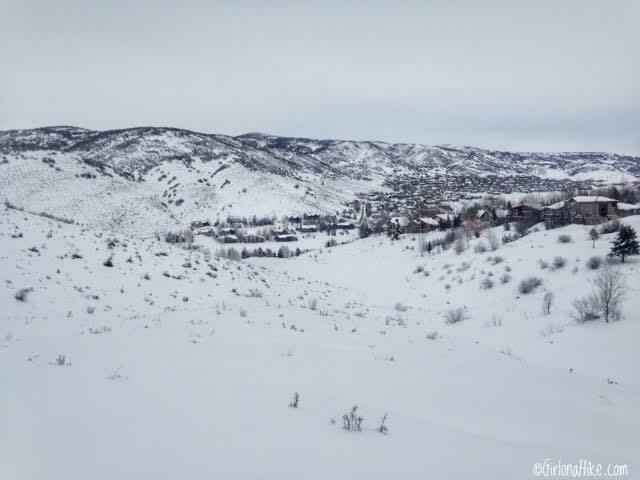 The hills on the other side of the lower houses is where the 24-7 Connector Trail is located - another great year-round trail. Around 1 mile you will cross the first of two roads. Leash your dog to cross. The trail picks up to the left of the private gate. 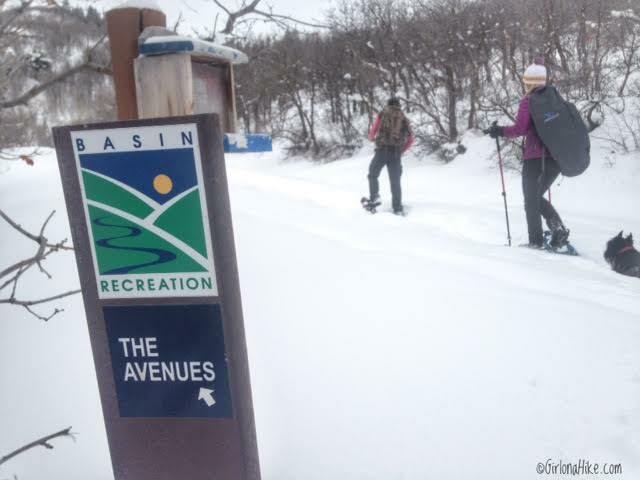 The trail name actually turns into "The Avenues" - not to be confused with The Avenues neighborhood of SLC and The Avenues Twin Peaks. Stay left. This is the 2nd road but it was actually snow-covered. 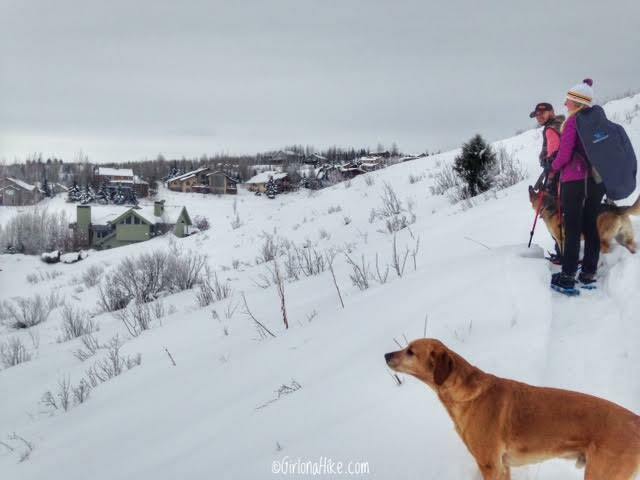 In summer, you'll want to leash your dog here again to pick up the trail. 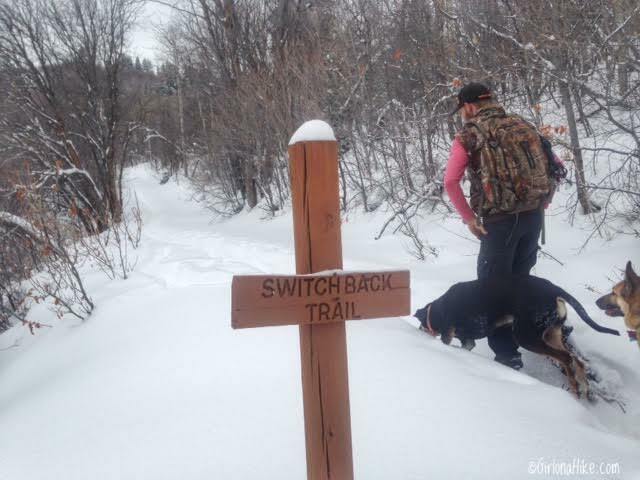 On your right you will now see the sign for Switch Back Trail - take this and it will head up further into the hills. It's always more fun to hike with friends! The trail cuts through more trees and also begins to leave the neighborhood area, and becomes prettier. 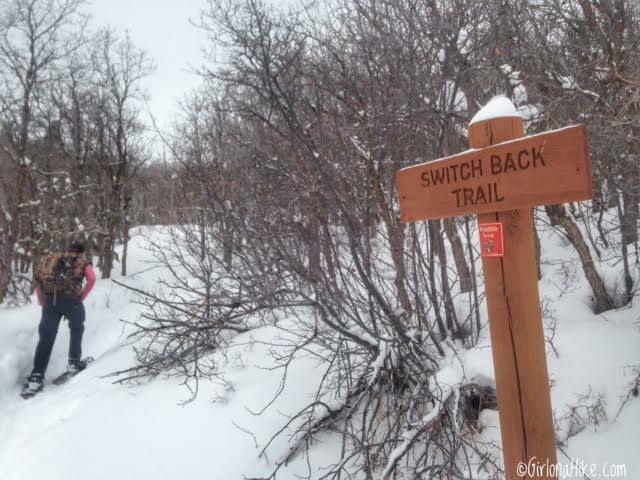 You'll see one more Switch Back Trail post; keep left. And in another 50 yards turn left again. 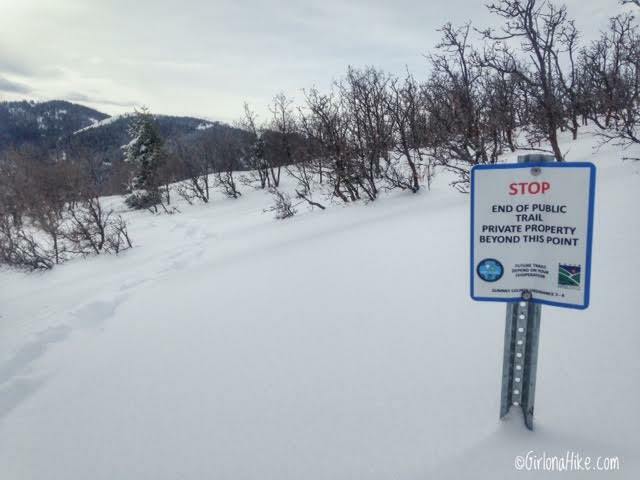 There are other signs that say private property - you can't really get lost. 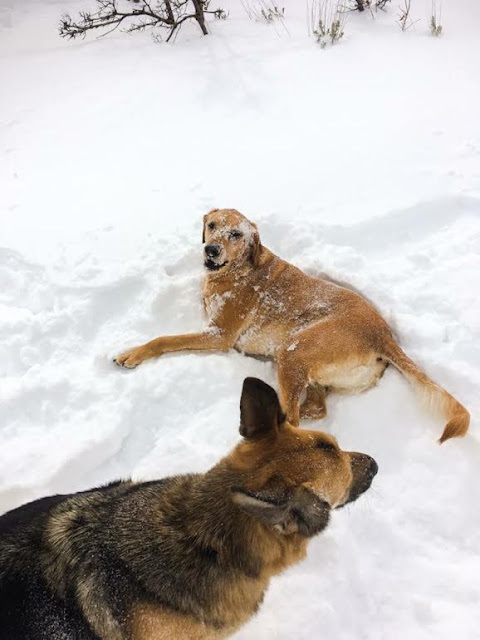 Charlie and Tallie play in the deep snow! After what feels like you may have missed a trail split, you'll arrive at a "T". If you go left it just keeps wrapping around the side of the hill. Instead, go right following the sign that says dead end. The dead end actually leads to the Moose Hollow Overlook. Only 1/2 mile to go! 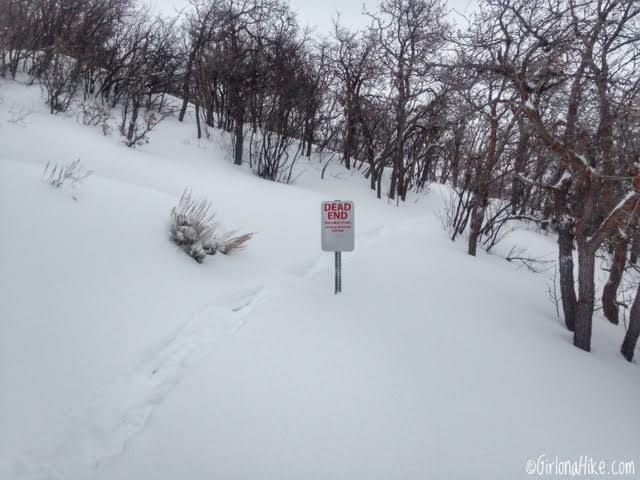 After 1/2 mile you will reach another sign that says end of public trail. Hike past this another 20 feet (to that lone pine tree) and you will reach the Overlook! 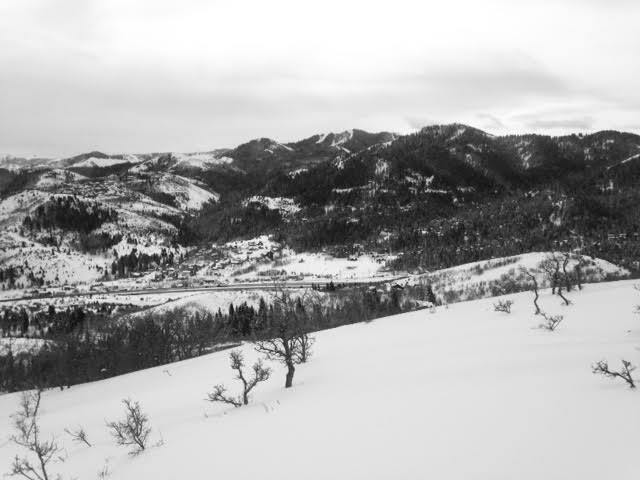 In the distance you can see one of the ski resorts as well as Summit Park Peak (the peak on the right). 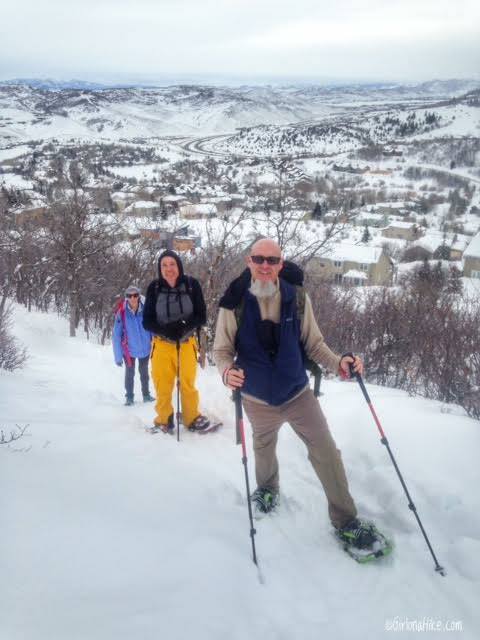 In case you are wondering what snowshoes I have, I wear the MSR Lightning Ascents. I have had these for about 6 years or so and they've been awesome. If you are beginner you can buy cheaper ones from CostCo for around $130 (I have seen similar snowshoes at my local CostCo for $70). If you aren't ready to buy, REI does rent snowshoes for $12/day if you are member, and $30/day for non-members. Summer looked SO different compared to when I hiked it Winter 2016. First, it was extremely green, and secondly the "overlook" was really overgrown. 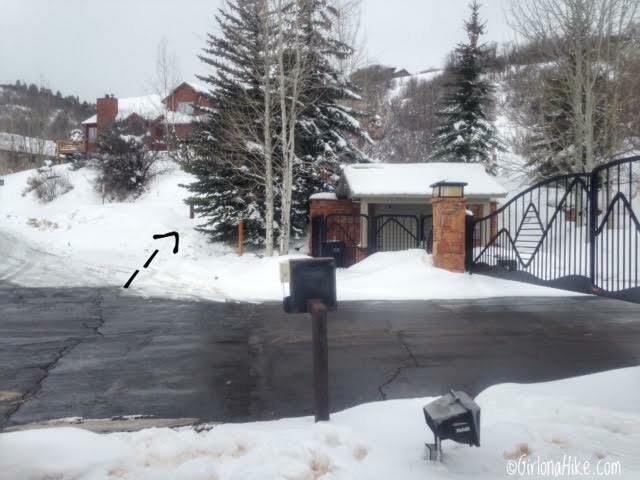 There had to have been close to several feet of packed snow when I did it, because there were hardly any trees. In Summer, the trees were so tall you could barely see anything from the top. The same spot had an opening to look out to the South, but I definitely prefer this trail in winter. However, this did make for a great trail run back down. 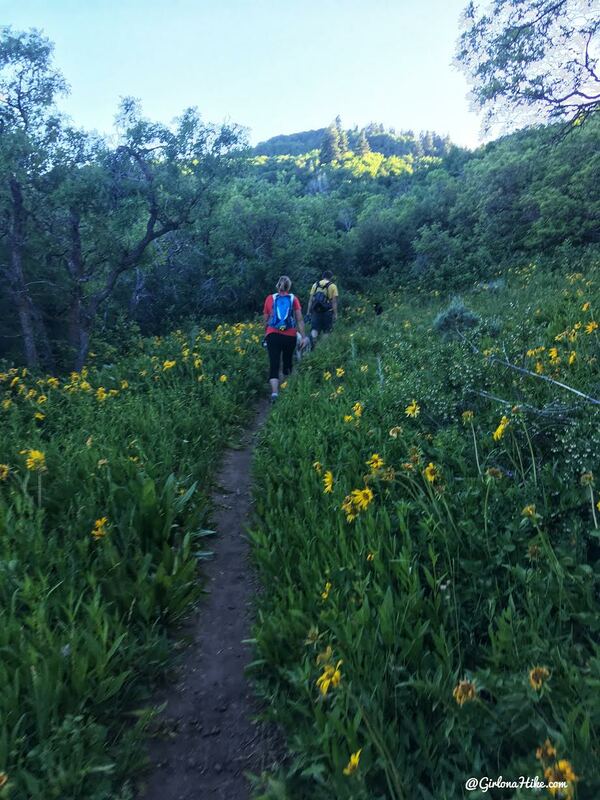 Summer does offer lots of wildflowers and plenty of shade with cool temperatures. 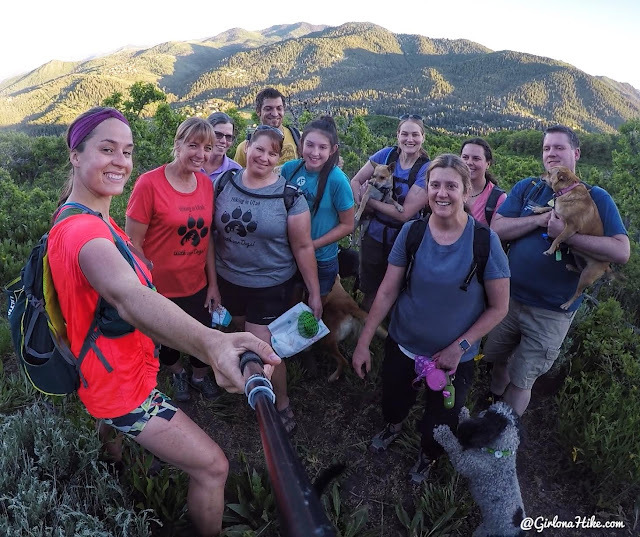 "Hiking in Utah - with our Dogs" crew! We hike every Tuesday night - you can attend our hikes by joining our Meetup page. My track via Gaia GPS. Cool hike! 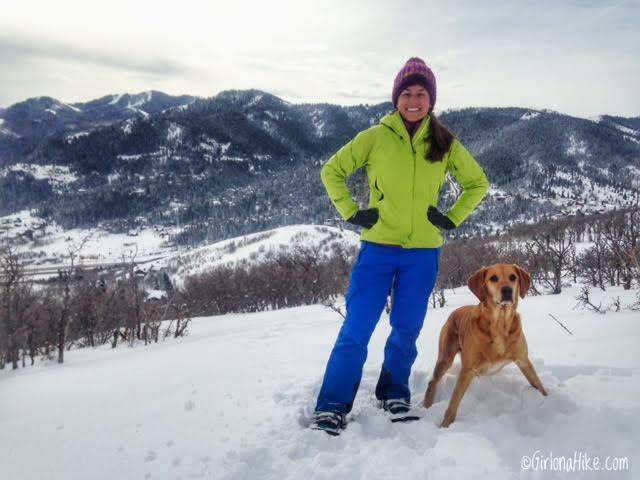 Looks like so much fun in snowshoes! Have always wanted to check out this area. Just out of curiosity, is there a reason you don't keep a collar on Charlie while hiking? Yesterday I took 2 girlfriends with me on this hike. It was beautiful. Opting for the spring we saw many different types of wildflowers just beginning to bloom. Clear blue skies, amazing views. Thanks for the great directions, we were able to hike to the overlook and enjoy 6 beautiful miles together. 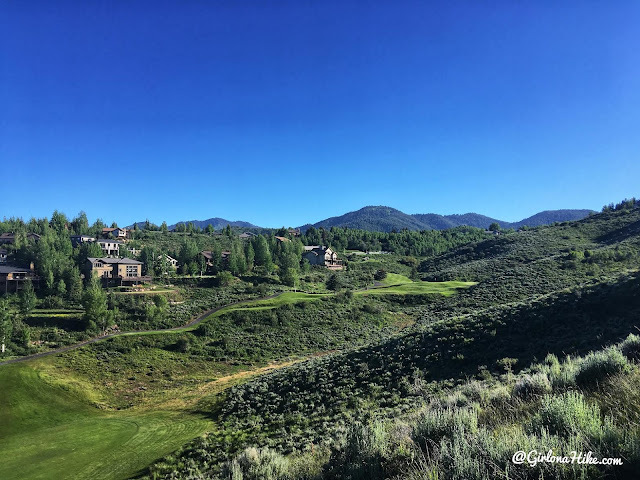 After the hike we went over to the Park City Running Company which was so close and then enjoyed a taco tuesday at a nearby restaurant.